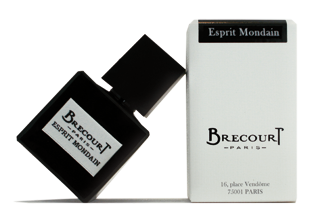 Brécourt Paris is a french niche brand headed by Emilie Bouge, a perfumer from Grasse. She developed a line of perfumes presented in sleek, square black bottles and in a variety of masculine and feminine scents. I tried four, picking the ones that interested me most from reading the descriptions. Notes include bergamot, magnolia, myrrh, sandalwood, iris root, ambergris, labdanum, vanilla and musk. Of course I started with an amber. And as ambers go, this is a lovely specimen, more on the sweet side, but rounded and well-made, if not exactly reinventing the wheel. I would call it a middle-of-the-road amber, not too much, a good starter amber. And if I didn’t have numerous amber renditions, this would be nice to have. Notes include bergamot, cinnamon, storax, date, cedarwood, leather, honey, tonka bean, patchouli, labdanum, benzoin and musk. If you buy this without waiting for its drydown you are in for a surprise! Haram starts out like the perfect heavy, boozy, ambery oriental. Bringing to mind all the souk-inspired, fruit-stew and spice fests of Lutens et al. It smells great. But all of a sudden, about half an hour into wearing it, I smell freshness, a blast of post-shower clean-ness, a laundry smell, the smell of those infamous dryer sheets. WTF??? What happened? Where did my boozy, spicy oriental go? I’m still looking for it! There must be an overdose of clean, white musk that takes over the entire perfume. Maybe it is just my skin, so if anybody tried this, I would love to hear about your experience. On me Harâm is the incredible vanishing oriental. Notes include tangerine, carrot, frankincense, tea, heliotrope, orange blossom, vetiver, iris root, cedar wood and musk. Love the name! So what does trouble smell like? It starts out quite innocent and fresh. Tangerine, cloaked in light and airy incense, Eau Trouble progresses into warmer territory in the heart, but it stays pretty tame throughout. Lovely, nice, but tame. Trouble is something else. Eau Trouble is a cologne-style fragrance with pale orange blossom at its heart and soft, sweet musk in the base. Unobtrusive and even a little faint. Not really worth the trouble. Notes include bergamot, lemon, tangerine, jasmine, tea, ginger, cedar wood and musk. White Water – another lovely name, if we leave politics aside. Eau Blanche is a citrus fragrance first and foremost, and a long lasting one for the genre as well. After the lemon dominated opening, tea and ginger are quite lovely and refreshing and cedar provides a good base for the citrus to hang on for a long time. This is a very refreshing and uplifting summer scent. The perfumers intent to capture her childhood memories on the Italian island of Capri, is executed well in my opinion. All in all I like Ambre Noir and Eau Blanche best, they are also the ones with the best wear time. With Harâm I like only the first half, I do not care for dryer sheet city, and Eau Trouble is much ado about not very much. The line is beautifully presented. While I don’t feel the pressing need to own any of the ones I have tried, I feel Ambre Noir and Eau Blanche are a good starting point for budding Perfumistas or make great gifts for non-perfume-manic folks. The website offers up to four free samples to try, from the fifth it is 1€ per sample and one has to pay for shipping, but it is not much. A great service every company should think about! This entry was posted in Amber, Citrus, Floral, Fragrance Reviews, Incense, Iris, Oriental, Woods and tagged Brecourt, Emilie Bouge, Fragrance, Perfume, Review. Bookmark the permalink. I bought samples for all their perfumes… more than half a year ago and so far I tried only two. I have no idea why I stopped. I plan to try them. I will try them. One day. I actually liked Harâm when I tried it. It didn’t become unpleasant on me at any point. But I thought that it reminded me a lot of some other niche perfume and I couldn’t remember which one. And it bothered me. I will try it again soon and see if I get the strange metamorphoses you get. Now that is good to hear that the incredible vanishing oriental did no such thing on your skin! I tried it again yesterday (I was that curious after your review) – and still no, I do not experience what you’ve described. I might be not sensitive to some synthetic musk in it that you feel and identify as laundry scent. But I want to mention that for me the entire perfume smells a little too… artificial(?). It resembles (in feeling, not scent-wise) Tauer’s Pentacords. Never heard of this line, but I found your reviews most entertaining! What’s with that “incredible vanishing orienta”, eh? I like the sound of the other three – I would even take the trouble to seek out the orange one. Is it a bit like Penhaligon’s Castile, only that’s a light, airy, not much of anything orange scent and I liked it well enough. The “vanishing orienta” appears to have been a Freudian slip. Also , I turned my auto-correct facility off! What a very sensible company, only charging postage on 4 samples. They must be applauded for that. I can just imagine your disappointment/horror when the boozy, spicy, amber oriential turns into a fresh laundry scent! Absolutely! Samples are important! I love when a company gets that! Ambre Noir is the only one I’ve tested, and I agree with your assessment: it’s a really solid amber, but it’s got a lot of competition in the amber-lover’s cabinet! However, for the price, it’s an excellent perfume, and if I didn’t already have so many I would probably pick this one up. The amber market is becoming REALLY crowded lately, isn’t it? I like amber fragrances, but I’m starting to wonder if it’s all a bit of a muchness and falling into redundancy. I like the packaging – and I love the sample idea – but I’m sorry to say I’m not running to try these. Thank you for bringing this line to our attention, I’d never heard of them! Harâm definitely sound like it is the most intriguing. I take it that the oriental never reappears? Wel lI have know idear if the perfumes are nice or not. I orderd 6 samples in dec. 2012 and up til know jan. 2013 I haven’t received any thing yet. Wrote them tree times but I did not get any reply on any of my mails. It’s a pity becaurse I looked forward to try them. That is very unfortunate! I hope the situation will be resolved soon and you get to try the perfumes! Oh no, that does not sound encouraging at all, appalling customer service. I hope all goes well in the end. of course no,I called like 2o times,but every time,same thing happens,they got my name and phone number,but nobody calls.I think the same thing has happened to you as mine.When I ordered,there was nothing under “my account”.I don’t know what the hell going on.But I may say you that,forget about your money and your bottle.I don’t know whatelse can be done,this is horrible. I called last week too,the lady on the phone said ” Oh yes,I remember you,I will reply back to you very soon” it was 24 January when I ordered,now 4 February,I haven’t received neither my order nor a even a reply back. I just ordered from their website and I can’t see anything under my account that says I ordered. I also emailed but I got no reply. Im worried that I just lost my money…Did some of you guys got a reply already? Or better yet, have your packages arrived? I’m appalled at the bad customer service at Brecourt, I hope your money is not lost and you get your order soon. I really don’t know what to do?As I understand from Ana10 I am not the only onee,any advise please ? I would send a very clearly worded email that you want your money back or you’ll contact your lawyer. Hopefully this will prompt them into action. Well actually my lawyer had gone there couple of hours ago.The address appears on their web site is not their shop address.It is a little office with just a secretary,that they just receive and send documentaries.When my lawyer explains the story and wanted at least my payment back,this secretary claims that she is not responsible from the money pay backs.My lawyer gave her my passport-credit card’s copies and letter to the responsible person(I am wondering who that wise person is !!!! ) that expains my damnification.And she says,she will deliver them to the responsible one. Finally,after my lawyer has gone to their office,they called me and said they did not receive any information or any order from me and asked me to mail them the transection of my payment and my address after receiving those,they promised to send the perfume right away. I think if you call her,she will help you,cause I told her the story that there are other people who has the same trouble. Ozlem, no one is answering. I tried calling the number you gave me. They reply via this address. Be sure that you still keep your transection. Ozlem, may I have your email so we can update each other? ozlem, I adapted your email address to avoid it getting caught by spam bots, hope that is okay! I am leaving comments to those blogs.If you also comment,maybe the responsible people be aware what is going on !!! What adress are you going to use for mailing them? Their email? Dear all, we in Brecourt, care a lot about opinions, comments, feedbacks. Indeed, samples are vital tools for promotion. That’s their main purpose. For those who had bad experience with our delivery service I would like to explain us. I am glad that the people who had trouble receiving their samples have an opportunity to get in contact now. Thank you for your kind words about my blog. I will be in touch through email. Unfortunately, I can’t find Haram for sale anywhere on the internet. I called Indiescent in NYC a few weeks ago and they said they expect some in and would email me, but I have not heard from them. I’m despairing of ever finding a full bottle of this raving beauty. Any thoughts on where I could find this one? I concur with your review of Amber Noir – it’s pretty, but it doesn’t really stand out from the crowd of ambers already on the market. Then again, it may be a chemistry thing, and this one might strike the perfect note for a person who hasn’t found their Forever Amber, yet. Haram is now called Farah (but the same scent, just different name) and is available in Europe. Looking at the company website is surely a good idea to find retailers in your area. Good luck! Happy to hear you love it so much! I just noticed the post from Brecourt above. I’ll write the company directly. Thank you for your excellent site. I’m pleased to have found your well-written thoughts on the grand passion of fragrance.